On the side of this camera are two pins with a jumper between them. Is that J2 on the schematic? What's it for? Thanks a bunch Phil. I'm building an NPN LED driver for a super bright LED to plug into the jack at the top. So I was curious what that other jack did. An annoyance is that the jack doesn't use 0.1" spacing. As devices continue to shrink, I think it's important to leave the 0.1" standard behind, in favor of something more compact. The Hirose DF11 series, with its 2mm spacing, is an ideal compromise between the now rather gross 0.1" standard and tinier spacings that can't hope to accommodate through-hole methodologies. It offers the additional advantage of keying, which eliminates the danger of reverse- or offset-insertion. The connector you will want to use for a mezzanine board is the Hirose DF11-6DP-2DSA(24). If you are planning to use a cable connection instead, specify the Hirose DF11-6DEP-2C, along with pre-made cable inserts, such as these. Phil, thanks for the suggestion. I wanted to work while I had the time and energy, so I decided to use what I had on hand. So I bent the pins on some extra long headers until they matched the 2 mm spacing, and soldered them to a strip of 0.1" perfboard. I could have driven the LED from the Basic Stamp's I/O pin, but I eventually want to learn how to use this sensor with the propeller object. So I'll always drive the LED from a 5 volt source and be de-coupled from the controlling logic's voltage. Be careful about using regular headers with 2mm sockets. The dimension of a 2mm pin is 0.020" square; that of a 0.1" pin, 0.025" square. You can easily spring the socket with a too-large pin, rendering it unreliable should you later want to use it with the correct pin. In your case, it would be better to use round resistor wire than to use header pins. Well this is an example of where a little knowledge can be a dangerous thing. I'll swap the pins out tonight and hope no damage was done. Update: I rebuilt the NPN LED driver using resistor wires and also added a standard 3 pin header as well. It works great. So I am trying to use the TSL1401 with the Propeller backpack and my BS2e. The backpack has a usb to prop plug hooked up to it, and the BS2e has an RS232 cable connected to it. The propeller tool can talk to the backpack and the monitor program sees the BS2e. I searched in the OBEX and found the TSL1401 driver (http://obex.parallax.com/objects/553), but I am unclear how to use it. There's the driver and the test. When I use my propeller tool and prop plug I can upload either program to the backpack, I don't see anything coming back down the usb cable. If I start up the monitor program, it sees the BS2e and offers to upload a program to it, then exits. So I am a bit lost. Are there any pointers on how to use these three together? 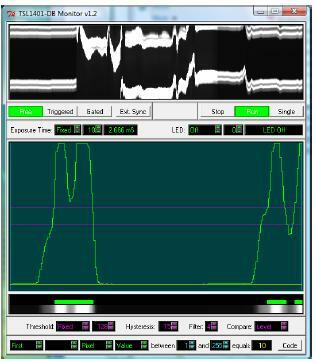 The monitor program from the TSL1401-DB product page expects a MoBoStamp-pe to upload to. The MoBo uses an onboard AVR coprocessor as the TSL1401 driver, so it's incompatible with other configurations. Thanks Phil, I'll try this at home tonight. Update: I tried this at home last night and it worked great! As a test I moved a box with a bar code on the side past the line scan camera. I could see the hump in the graph (the box) with little ripples on the hump (the bar code). As a I played with the focus the ripples became much more clearly defined. I could also watch this pattern move through the field of view. Totally cool and makes focusing the camera much easier. Now I need to write more code to recognize patterns. 2. Determining distance by laser triangulation. I don't use any IM services; sorry. But I can give you a general outline here of what you need to do. In my scanning demo, I used two micros: the MoBo for driving the TSL1401 and another BASIC Stamp to drive the servo. They were completely unsynchronized. The BASIC Stamp just slowly slewed the servo as the MoBo was outputting scan data to the PC host program. Perhaps that will give you some additional ideas. The catch is that it won't work with the standard PC host program, since that program uploads its own driver. So you would have to provide your own method to convert the 1401 output to an image. 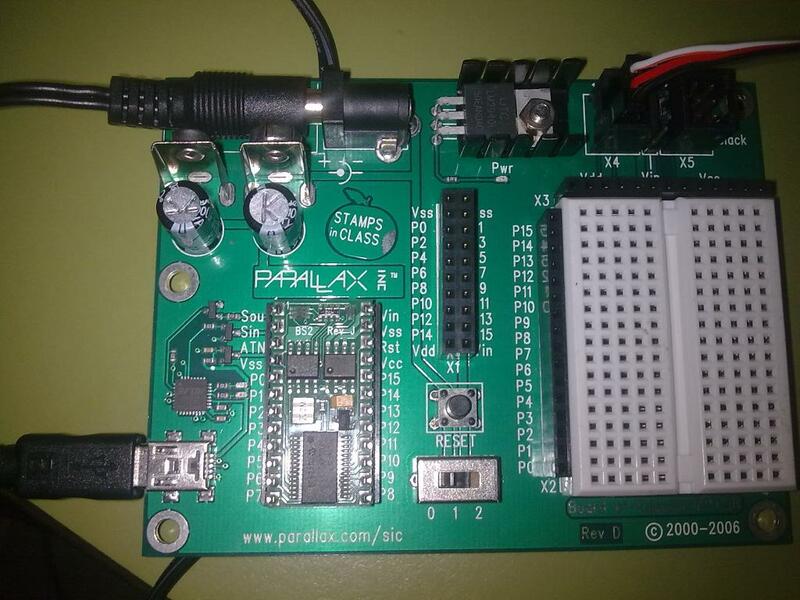 If you wanted to synchronize motion with the standard PC host program, you might also try using the strobe output on the 1401's mezzanine connector to trigger a driver for a geared stepper motor. Then set up the host for LED strobing. The flip side of this would be to set up the host for external triggering and let an external motor driver provide the trigger input to the other daugterboard connector after each step. 3. Board of Education USB Full KIT. 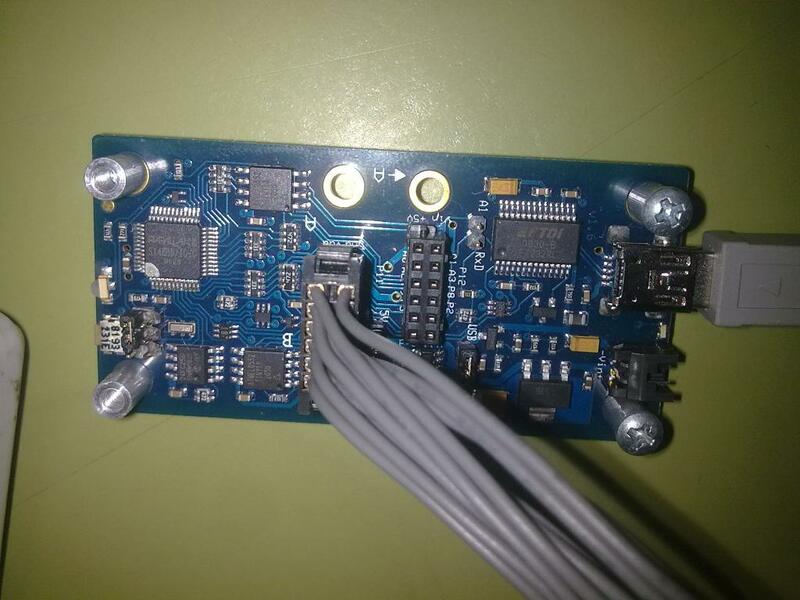 I have connected the TSL 14010 linescan sensor with Mo Bo 2P/2PE and i have installed the drivers for Mo Bo then i run the TSL1401 monitor SW and its working fine now in your project ( 50$ bill scaning ) you are using Board of Education connected to the Mo Bo 2P/PE, Just i want to know the cable ( Core 3 White Black Red Wires ) that going from Board of Education to the TSL 1401 what its connected ??? i will connect the project and take a photo so you can tell me what is missing. The BoE isn't connected to the MoBo -- just to the servo that rotates the MoBo so it can do the scanning. I wish to be patient with me, what do you mean of ( Servo ) is it HW or SW and if it was SW from where i can down load it . 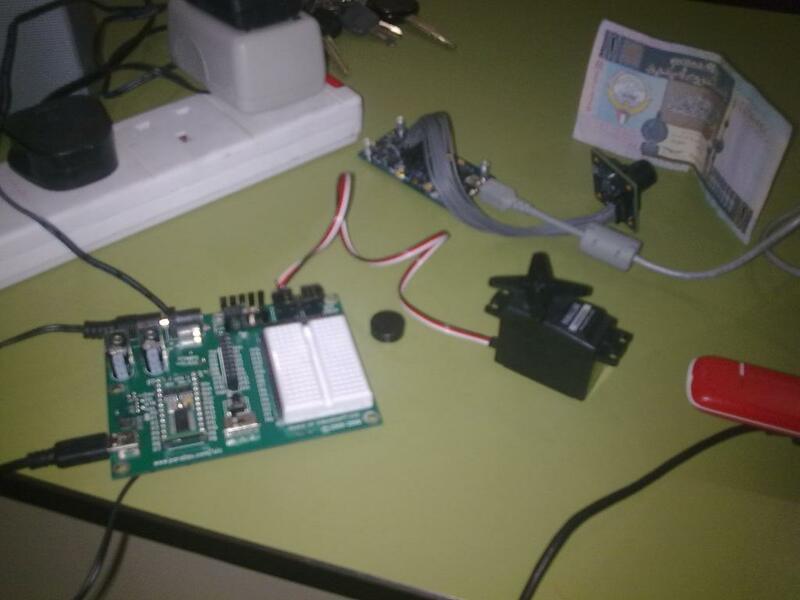 The servo is a motor that physically rotates the Mobo to do the scan. Thanks alot, this is the part what iam looking for. Please post a photo of your setup, a schematic or chart showing how things are connected, and your full source code. Without that info, it's impossible to diagnose what the problem might be. In order to scan the bill, the camera has to be attached to the servo, and the servo has to be programmed to slowly rotate the camera during the scan. I didn't save the program that does the scanning. You should be able to write one easily enough, though. The PBASIC code that you can download from the Ping))) mounting bracket product page will get you started. It rotates the Ping))) at a fairly fast rate, so you will need to experiment with the code to figure out how to slow it down. I'm not going to write the code for you. You will have to do some work yourself to figure out how to make it work. I am looking for a cylindrical lens to use with the TSL1401-DB that can be used with its 12x0.5mm mount? The lens will be used to compress a laser beam in line with the linear array. Welcome to the Parallax forum! Just so I understand, are you trying to focus a distant laser dot on the linescan array? We are looking at the centroid of a return beam of a laser. The laser's path is about 12 inches after it hits the last mirror and heads towards the TSl1401-DB. Obviously, alignment is critical to hit a ~60um wide linear array. To make alignment a bit easier, I thought of putting a cylindrical lens in front of the linear array, replace the original lens (which we don't use). This would increase the amount of light the linear array will see, which means we could decrease the exposure time, and specify a less powerful laser.